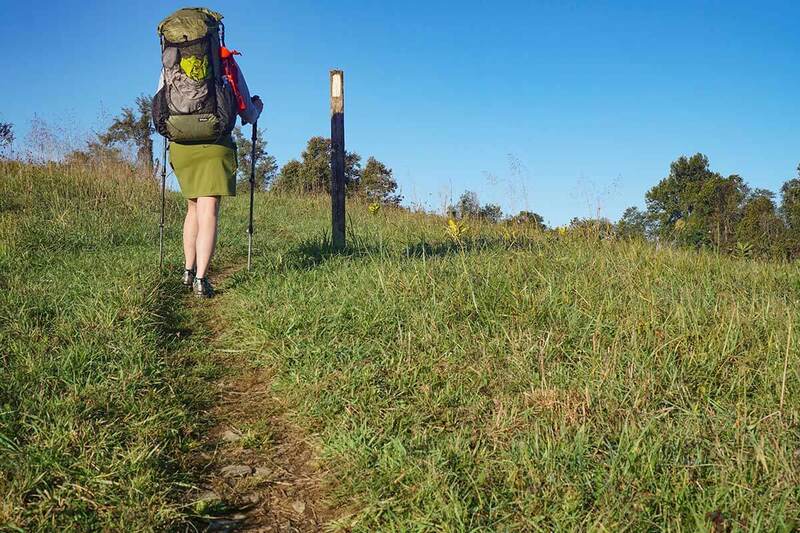 This Guide to the AT Section Hike – Shenandoah to Harpers Ferry, is an installment of our no-car-needed, low carbon AT hiking Guides. This beautiful section has the infamous roller coaster, along with great vistas like Raven Rock and Sky Meadows Park. It connects two popular AT trailheads—Shenandoah National Park (Front Royal, VA); and historic Harpers Ferry, WV. When combined with our Low Carbon Section Hike via Train – Harpers Ferry to Harrisburg PA , you have ~180 great miles of the AT easily accessible by public transportation. Hike green! We are big fans of leaving the car at home when we go hiking. Because the AT goes through or near urban areas, it’s not difficult to section hike portions of the AT using only public transportation. Many of these are among the nicer sections of the AT. This guide is for an AT section hike that you can undertake solely using public transportation from Washington, DC. This 54 mile AT section could be done in one long weekend (3-4 days, e.g. an extended Memorial, or Labor Day weekend). It would also be a great hike for fall color viewing as it has somewhat less foot traffic than the adjacent Shenandoah Park. The start of The Roller Coaster, an infamous section of the AT with over 10,000 feet of elevation change in only 13.5 miles! And that was only part of our FUN for the day. Alison’s face says it all. Blue Ridge Vistas: This section of the AT is just gorgeous. There are numerous overlooks including the famous Raven Rocks, and the endless ridge top vistas from Sky Meadows Park. Because of the wonderful overlooks and clearings on this section, it would be a great hike for fall leaf viewing. Blackburn Trail Center: When you arrive at the Blackburn Trail Center, you are greeted by the trail boss and his wife. More often than not, trail magic will appear making the end of the roller coaster that much sweeter. 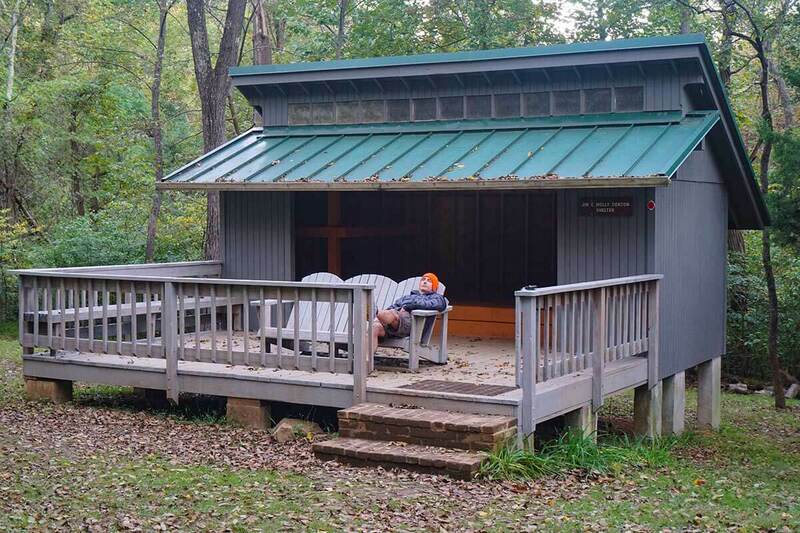 Bears Den Hostel: This rustic stone building from the 1930’s is a gem on the AT. The hiker deal for $30 includes: bunk, shower, laundry, soda, pizza and a pint of Ben & Jerry’s ice cream. Our trip didn’t allow us to overnight there, but we did stop for the $0.50 Cokes out of the fridge and a lovely break on the lawn for a snack and rest at a covered picnic table. Ride the Roller Coaster: The world renown roller coaster is a 13.5 mile section of trail that closely resembles a roller coaster. Ok, not really. It’s really about 10,000 ft of elevation change in a very short distance that will keep you fully entertained. 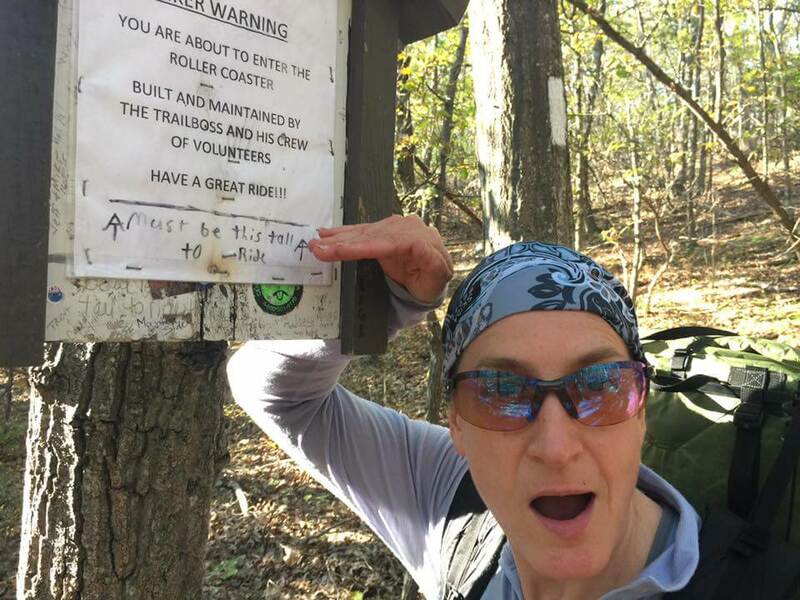 Harpers Ferry Overnight: Any hike that includes an overnight in Harper’s Ferry is a good hike. The town is so lovely, it is always a highlight. Overview map of the 54 mile route. Beautiful mountain meadows and views: Alison hiking up to one of the many great vistas at Sky Meadows Park. Our guide gives more detail to this specific section of the AT, and in particular how to access it by train and bus from much of Northeast US. $13 Train: From tip end at Harpers Ferry, WV, it’s only an hour and $13 via train to our front door in Washington DC! This hike begins at the northern end of Shenandoah National Park. You don’t need to enter the park, just begin on the outskirts of it on the more easily accessed AT crossing of US 522. Unfortunately, as of this writing, there was no public transportation directly to Front Royal from Washington DC. So we had to string together two transportation modes to get to the trip start at around 6:00 pm. A Omniride commuter bus leaves from multiple locations in downtown DC and goes directly to a commuter parking lot in Gainesville, VA. Cost was $6.50 using SmarTrip card or $8.75 with cash. Heading out of the city, commuter buses only leave in the afternoon “after work.” First bus leaves DC at 3:30pm ish (depending on where you pick it up) putting you in Gainsville around 5:20pm. From there, you can Uber (about 30 min) to the start of our trek (ask to go to Trumbo Hollow Hike Trailhead). This Uber trip costs about $50. Not cheap, but worth not having to shuttle, thus allowing us to do a one-way trek while still going low carbon. And the train ride back is only $13. Megabus has one trip a day from Washington Union Station, leaving at 9:20am arriving Front Royal Crooked Run Park & Ride at 11:40am (cost $30). From there, you can Uber (about 15 minutes, $20) to the start of the trek (ask to go to Trumbo Hollow Hike Trailhead). NOTE: The combination of Uber/Lyft with the train (or bus) is a game changer for low carbon hikers. The ability to hook into a scheduled train or Greyhound route makes what used to be a “close-but-no-cigar” hike, into something quite doable. The easiest thing is to overnight in Harper’s Ferry and catch an early morning MARC train (Brunswick Line) back into Washington DC’s Union Station (or a few Suburban Maryland stops before DC). The MARC trains are super early, but that’s OK as you’ll get back into DC in time to catch many of the early trains and commuter buses to your final destination. 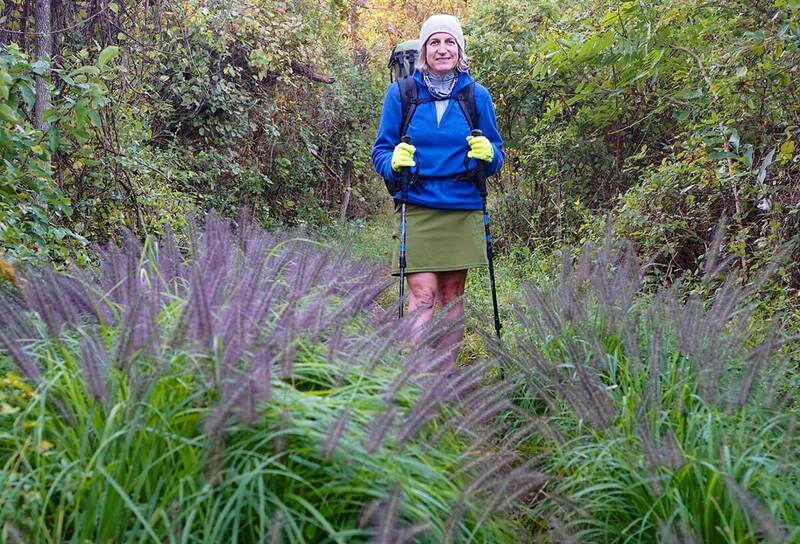 A crisp fall morning on Day 2, perfect for some hiking on the AT! The section between Shenandoah National Park and Harpers Ferry is a rather popular section hike. The multiple overlooks and great overnight camping options make it a very nice section the AT. 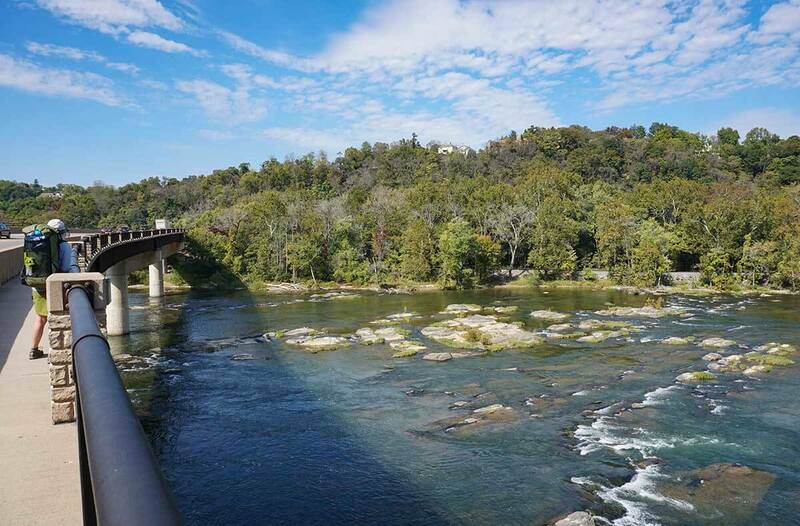 It follows the Appalachian Ridge for 54 miles through the State of Virginia culminating in a breathtaking walk across the Shenandoah River Bridge into West Virginia and the city of Harper’s Ferry. There is only one park you walk thru, Sky Meadows State Park (which has its own stunning overlook). Otherwise, this section is a nicely challenging walk on the AT. Relaxing on an Adirondack “Bench” at the recently renovated Jim & Molly Denton Shelter. It has a covered picnic pavilion and a solar shower! Your first full day (if you started hiking the nite before) will be lovely. Keep an eye out for great overlooks because you come upon them very quickly. Sky Meadows State Park, really does have superb mountain top meadows and views. It’s a great lunch spot. After that, you also get to cross the not-so-lovely, first of two death-defying major highways on this section (no bridge, no stop signs, just put your big boy pants on and run for your life) at John Marshall Highway (VA55). We ended our day at Rod Hollow Shelter in prep for roller coaster day. Several nice campsites and hammock hanging areas are available at this shelter. 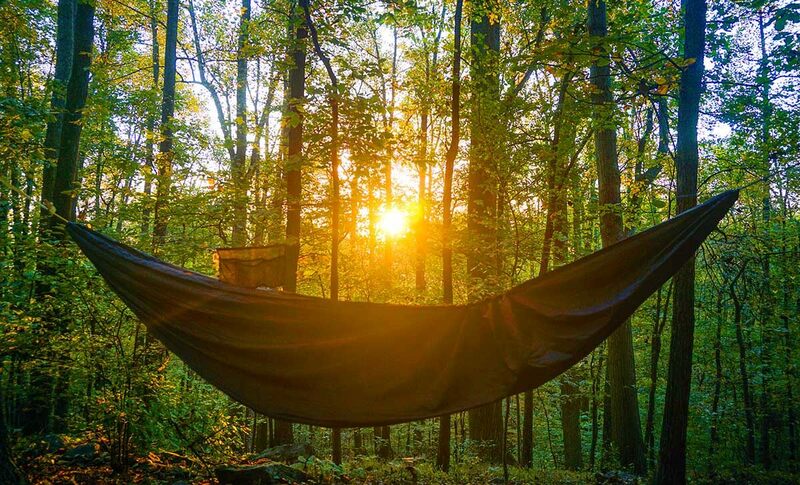 Sunrise above our hammocks at the Blackburn Center. First thing up the next day is riding the roller coaster! As the AWOL in The A.T. Guide notes, it’s really “13.5 miles of tightly packed ascents and descents.” Besides an amusement park aspect, this day also contains the Bears Den Hostel (an overnight option). The Bears Den Hostel was our lunch spot and we enjoyed a covered picnic table, a few cokes, and some shade from the sun. Shortly after the Bears Den you cross your second death-defying major highway, Pine Grove Road (VA 7). Lunch and a feet-up rest at the shaded picnic table at the Bears Den. We grabbed a couple of 50 cent Cokes out of the fridge! Cold beer and chocolate cake trail magic at the Blackburn Center. Who knew these two food groups tasted so good together? Rt 340 Bridge across the Shenandoah River as you enter Harpers Ferry. Our last day was a walk into Harper’s Ferry. We wanted to enjoy some time in Harper’s Ferry so organized our section hike to do so. After Blackburn AT Center, the last section is fairly flat and offered up a nice stretch for your legs post-roller coaster. Coming into Harper’s Ferry is quite majestic as you cross the Shenandoah River Bridge to enter into the city. 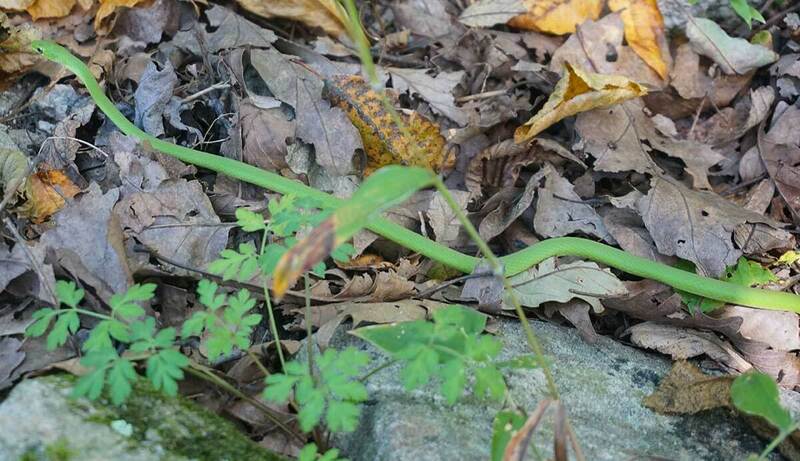 We saw a number of these beautiful, and delicate Rough Greensnakes as we approached Harpers Ferry. Adventure Alan under the sign for Adventure and as always finding the best coffee in town! The Guide Shack Cafe is veteran owned, veteran operated and sources its coffee and food from veteran owned Co’s! It opens early for coffee/breakfast. I’ve been planning an AT thru hike to celebrate my 65th birthday next year and just found your excellent site. You have the most informative, easy to read and use site. Thanks for sharing your experiences and expertise! I’ve looked at using Amtrak to get to my flip flop start, either Roanoke or Rockfish Gap from Florida. Both are reachable from Boston via Amtrak for the flip. Do you have any issues with stove fuel or a knife on the train? Would you recommend doing this stretch in early October? What dates did you hike this section? I’m headed to Baltimore (Inner Harbor) on a business trip and want to get in a few days of camping and hiking without renting a car. Your post is exceptionally helpful! One question: is there any compelling reason to travel north? The transit schedules work out better for me to go south. Friday evening train & overnight in Harper’s Ferry and then spend the last night at Molly & Denton Shelter before using the Megabus to go straight to Dulles. I’ll be hiking in early October. Is there cell signal to get an Uber from the Trailhead at US 522, near Front Royal? Or would scheduling a shuttle to the Front Royal park & ride work? Any other reasons not to go south? Thanks for the advice. I’ll stop back by and let you know how it goes! Can’t wait to get on the trail!!! 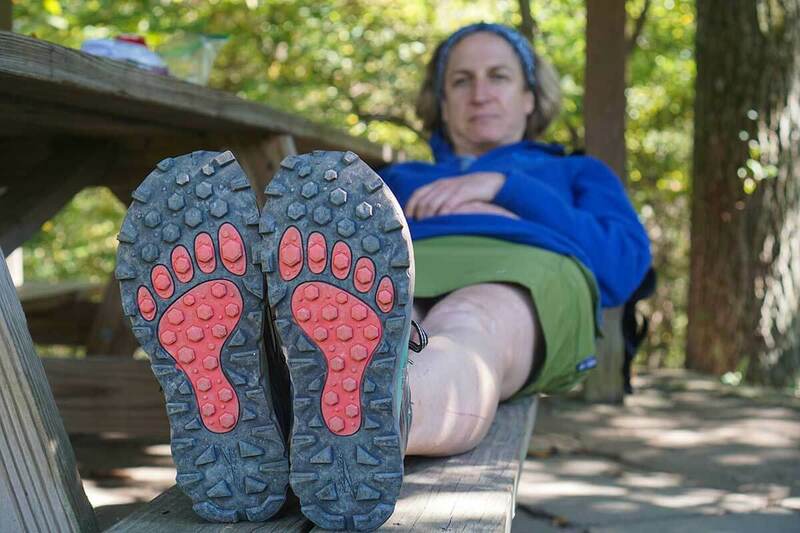 I have a question about footwear for the AT. 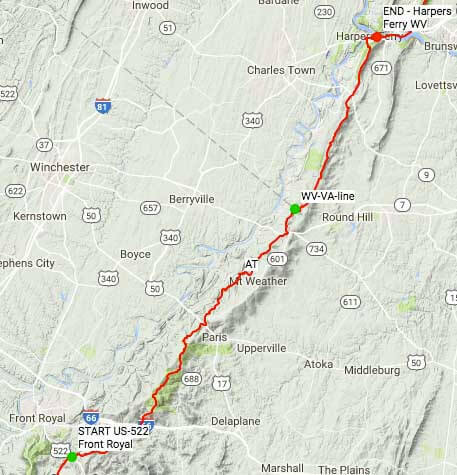 We are walking from Rockfish Gap (Waynesboro) for 6 days through the Shenandoah National Park. Will resupply with food half way when we pick up more hikers. Plan on having about 9 or less of weight not counting food and water (drink when thirsty). Pro Trail, circuit pack, bear bag. So I have always worn mid boots for Grand Canyon and other hikes, I was thinking of wearing Oboz Sawtooth low. 60 years old when I hit the trail. Bike 40-50 miles 4-5 days a week for the last 5 months dropped 30 lbs. I eat vegan too. So would I have trouble with the low tops? We go the last week of October. I have always worn boots to keep from turning a ankle and I never had any problems not even a blister but I would really like to be able to wear really light weight shoes for this trip since we are taking on some big mileage. It seems like all the thru hikers wear low tops. I was wondering if you would recommend this trip for beginner-ish backpackers. My girlfriend and I live in NYC and were eyeing this for our summer trip. It looks super fun. We’ve done some overnights in the Catskills so far but haven’t been on a multi-day trip yet. We were a little nervous about taking public transportation and being away from our car. Also, we would only be able to do it in August, and were worried it may be too hot. Any thoughts? Thanks! Just found a new option for getting to Front Royal from DC: Megabus (DBA Virginia Breeze) now goes from DC to Front Royal daily (including weekends) for $30/person. Looks like about a 15-minute Uber from the lot to the AT. The Megabus also gets there around noon so you’ve got more time to hike. Thanks for this posting. Just did this hike 7/16/17-7/19/17, almost exactly as you described except on the second night I stayed at the David Lesser shelter (very nice) instead of the Blackburn Center. Overall a very nice hike. A few additional notes: regarding the Bear Den Hostel — don’t be put off by the sign on the door stating that the place is only for hostel guests — if you knock on the door or say hello through the open window the nice guy will let you in and sell you sodas for $.50 (clutch in July). The only other food available at the hostel for people passing through were pints of Ben and Jerry’s ice cream for $5, which I happily purchased. 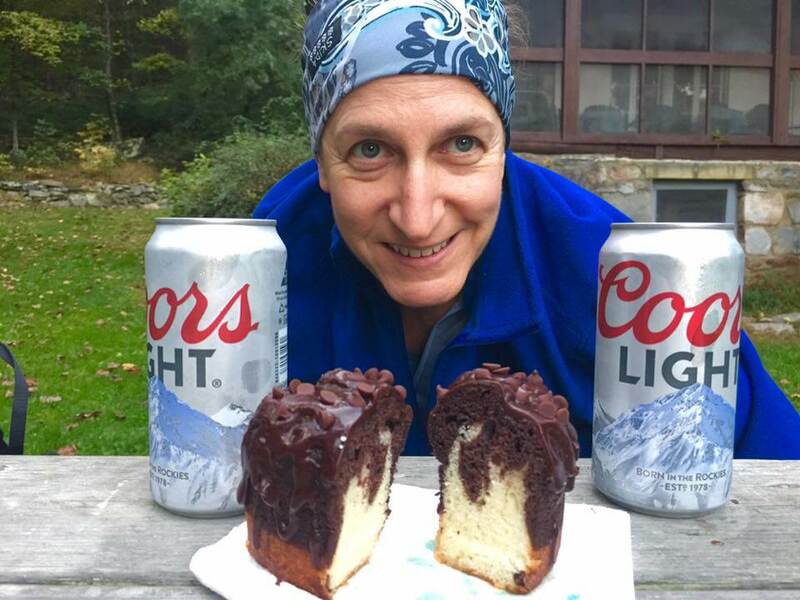 My “lunch” on Monday of a pint of B&Js + 2 cokes = 1440 calories is probably the highest calorie meal that I have ever had on the trail, which helped fuel my progress through the second half of the roller coaster. In Harpers Ferry I had lunch at the Coach House Grill N Bar (on High St.) and dinner at the Almost Heaven Pub & Grill (on Potomac St.). Both were good. I mention these because it was a Tuesday and several restaurants in HF are closed on Mondays and Tuesdays. Also stayed at the Econo Lodge, which was perfectly suited to me. One final comment, which probably goes without saying, but for others I would not recommend July for this hike. The roller coaster could have been called the log flume instead, as I was soaked from my own sweat from head to toe. But still a worthwhile hike done when I had some free time. I appreciate the time and effort put into these trip reports and trip guides. Great stuff chock full of useful information.